Published: May 12, 2014 at 12:35 p.m. Updated: Aug. 5, 2014 at 09:37 p.m. If we have learned anything in recent seasons, it's that rookies can come in and make an instant impact both in the stat sheets and in fantasy football. Owners who drafted Robert Griffin III, Eddie Lacy or Keenan Allen (to name a few) over the last couple of years can attest to that. So, who are the first-year players with the most potential for the 2014 campaign? Here's a look at 20 rookies you should target. Bridgewater isn't considered the favorite to start in Week 1, but he will be allowed every chance to surpass Matt Cassel for the top spot on the depth chart in training camp. He's entering a great position, as the Vikings have some talented young players in their pass attack and a future Hall of Famer in the backfield in Adrian Peterson. Should he win the No. 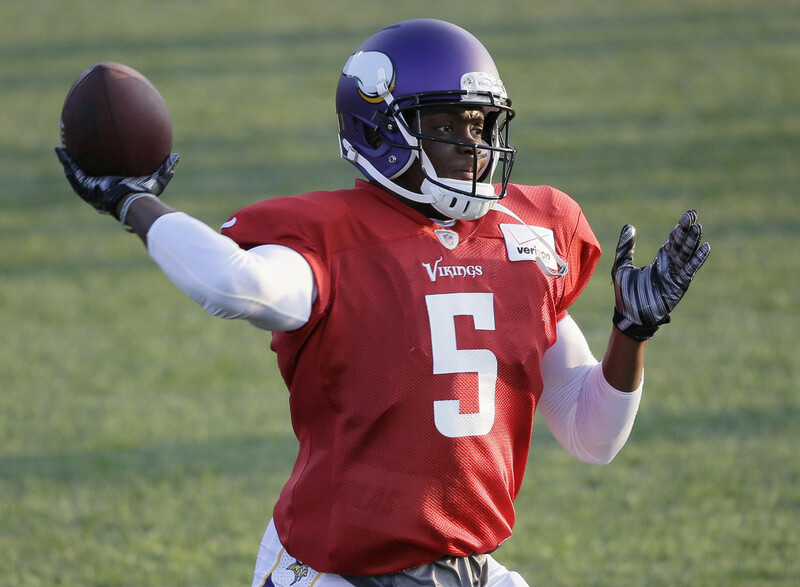 1 spot, Bridgewater's stock will rise to QB2 heights. Bryant fell to the No. 118 overall selection in the draft, but he landed in a favorable spot from a fantasy perspective. The Steelers lose Emmanuel Sanders to the Denver Broncos, leaving the No. 2 spot on the depth chart up for grabs. Markus Wheaton and Lance Moore are the likely favorites to open camp second and third at the position, but Bryant is a player to watch for owners in both re-draft and dynasty formats. Mason was a superstar at the collegiate level, breaking out as a junior with an Auburn-record 1,816 rushing yards and 23 touchdowns. He's an immediate threat to Benny Cunningham and could become a valuable fantasy handcuff for owners who draft Zac Stacy. Mason has little chance to pass him on the depth chart, though, as he lacks pass-protection skills and isn't much of a pass catcher out of the backfield either. Carey has no chance to unseat fantasy star Matt Forte, but he became Forte's preferred handcuff the second the Bears selected him. Remember, the team decided to let go of Michael Bush in the offseason. A versatile runner who has good hands out of the backfield, Carey could be the future of the Chicago backfield once Forte's time is over. Until then, though, consider the Arizona product a late-round re-draft option. The Giants appear set with Rueben Randle opposite Victor Cruz, so Beckham looks likely no better than third on the depth chart. Compared to Antonio Brown, the LSU product will have to overcome an injured hamstring and shine in the preseason to have any re-draft value. Beckham's stock is likely limited to dynasty leagues in most cases. Freeman, a rookie out of Florida State, is an interesting player for fantasy owners to monitor. He's behind Steven Jackson and Jacquizz Rodgers on the Falcons depth chart, but Jackson is entering his age-31 season and is coming off an injury-riddled 2013 campaign. Should the veteran go down again, Freeman could end up being the lead runner in a committee situation with Rodgers. He's a late-round, deep sleeper. The SEC's all-time leader in receptions (262) and receiving yards (3,759), Matthews is an intelligent and athletic wide receiver who happens to be Jerry Rice's cousin. That's not a bad bloodline. With DeSean Jackson (Redskins) and Jason Avant (Panthers) out of the mix, the rookie out of Vanderbilt would have to falter in camp to not open the season third on the depth chart behind Jeremy Maclin and Riley Cooper. Sims, who will be an older rookie at the age of 24, is joining a crowded backfield in Tampa Bay and has no chance to start with Doug Martin back from an injured shoulder. With that said, he will push Mike James and Bobby Rainey during camp and would be a viable handcuff for Martin should he open the season as his clear backup. If nothing else, Sims' depth-chart spot is something to monitor in the summer months. Rookie tight ends almost never make a big statistical impact, but it's tough to look past what Ebron brings to the table. A Vernon Davis clone, he could be used in a similar role to that of Jimmy Graham. Remember, new Lions OC Joe Lombardi was a former assistant with the New Orleans Saints. While I don't expect Ebron to become a No. 1 fantasy tight end overnight, he's going to be picked as a TE2 in re-drafts. I have never been a fan of USC wide receivers because of their trend of busting at the pro level, but I have to mention Lee because he has the potential to start as a rookie. With Justin Blackmon expected to miss the season due to suspension, Lee will have every chance to earn a prominent role for coach Gus Bradley. He's not a player to reach for in drafts, but Lee does have some late-round appeal in re-drafts. No rookie wideout entered a better situation than Benjamin, who was a favorite to start the second he was selected. The Panthers have to love his size (6-foot-5, 240 pounds), which will no doubt benefit him as a red-zone threat for Cam Newton. With that said, the Florida State product is a bit of a boom-or-bust prospect who wouldn't have as much fantasy appeal elsewhere. He'll clearly be on the late-round radar in re-drafts. Hill is a player fantasy owners need to monitor in the summer months. He's entering a crowded backfield with Giovani Bernard and BenJarvus Green-Ellis ahead of him on the depth chart, but an impressive camp could push him ahead of the Law Firm for some short-yardage and goal-line work. If that happens, he'll have some late-round appeal in re-drafts. Hill is no threat to Bernard, who should break out for owners in 2014. Williams appears set for a big role in New York, as the team has lost David Wilson and has only Rashad Jennings ahead of him on the depth chart. The rookie is a potential goal-line runner for Tom Coughlin, so scoring six to eight touchdowns isn't out of the question. Consider him in the later rounds of re-drafts as a deep sleeper with added value in touchdown-based formats. Hyde was considered one of the most talented runners in the 2014 class, but he landed in a terrible spot for his re-draft value. The Ohio State product joins a backfield riddled with injuries, as Kendall Hunter was waived by the 49ers after tearing his ACL in camp, while LaMichael James is at less than 100 percent. While he won't pass Frank Gore on the depth chart, Hyde should emerge as a nice handcuff somewhere in the later rounds. There are few things I like in fantasy football more than a playmaking quarterback who can run with the football. Enter Manziel, who rushed for over 2,000 yards and 30 touchdowns in two seasons at Texas A&M, and you have a surefire fantasy sleeper. He shouldn't be picked in re-drafts if Brian Hoyer opens the season as the starter, but Manziel is a player to keep a very close eye on during camp. A physical wideout with good size, Evans has drawn comparisons to his new teammate, Vincent Jackson. Not only can he make plays with the football, but he's also a strong run blocker who has the potential to be a No. 1 NFL receiver as his career progresses. Evans isn't likely to make a massive impact as a rookie, so fantasy owners shouldn't reach for him in re-drafts. Consider him a No. 4 option in 2014. Any time a wide receiver has a superstar quarterback like Drew Brees under center, he's going to have some value in fantasy land. Enter Cooks, who won the 2013 Biletnikoff Award for the nation's top wideout. A dynamic playmaker who will use his speed to his advantage on the fast track of the Superdome, Cooks could come in and make an impact in the vertical pass attack. He'll be picked in re-drafts and dynasty formats. West, a collegiate star at Towson, rushed for over 4,800 yards and 84 touchdowns as an FCS runner. While Ben Tate is the unquestioned starter for the Browns, he has had his share of injuries at the NFL level. Since West is the favorite to emerge past the likes of Chris Ogbonnaya and Dion Lewis, he'll be a viable handcuff in the late rounds for owners who land Tate. He'll hold some low-end, deep-sleeper appeal. The most talented wideout in the 2014 rookie class, Watkins is in a great position to succeed right out of the gate. The Bills traded Steve Johnson (49ers), so he's the clear-cut No. 1 wideout for quarterback EJ Manuel. That makes Watkins the favorite to be this season's edition of Keenan Allen, at least from a statistical perspective. He's best served as a borderline No. 3 or 4 fantasy wideout in most re-drafts. Sankey, who was the top-rated rookie runner of NFL Media draft guru Mike Mayock, has landed in a perfect spot to make a big statistical impact. The Titans have a vacant spot atop their depth chart after the release of Chris Johnson (Jets), and Sankey has to be considered the favorite to grab it ahead of Shonn Greene and his problematic right knee. Sankey has flex-starter potential in re-drafts across the board.